Because NDT does not permanently alter the article being inspected, it is a highly-valuable technique that can save both money and time in product evaluation. NDT Inspection Services is a family owned and run Perth business, servicing industry in WA since 1995. Keith O'Lone took over the business in 1997 after 14 years of working for various NDT companies throughout WA. With the help of his son Gary, the business has expanded mainly with referrals from satisfied customers. Our offices are centrally based in Malaga enabling us to supply our services around the metropolitan area within a short period of time. We are a NATA accredited company and provide NDT methods including Ultrasonic Testing of aluminium, carbon and stainless steel welds, forgings and castings and Ultrasonic Wall thickness evaluations of tanks and vessels. 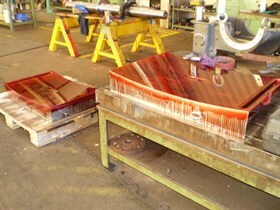 Dye Penetrant Inspection of ferrous and non-ferrous materials. Our staff offer expertise and inspection knowledge of industry sectors that include Mining, Oil & Gas, Petrochemical, Castings, Forgings, General Engineering and Fabrication.